the news for the wrong reasons. The Khyber Pakhtunkhwa (known as the North West Frontier Province until recently) and the Federally Administered Tribal Areas have progressively turned into the hub of extremism and lawlessness, and a training ground for the Taliban. News of violence from the region makes the headlines on almost daily basis. 20th century, not only was the frontier extremely peaceful, but also at the forefronts of a non-violence movement in South Asia. In fact, the history of this movement–what inspired its launch as well as what caused its demise–gives a good understanding as to why the Frontier has been the battleground of coercive activities that are mostly planned and orchestrated from more urban areas such as Karachi and Quetta. 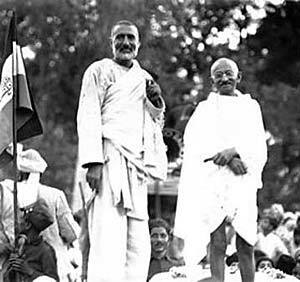 The non-violence movement was started in 1929 by a man named Ghaffar Khan, who was passionate about ridding his people from traditions of quarrels and blood feuds. “Factions, feuds, and social evils were rife among Pathans…They were like smouldering embers, always ready to flare up,” Khan wrote in his autobiography years later. Once his movement was in full swing, he was acquainted with India’s Gandhi and integrated his followers into the national struggle of the then British-India for independence. The history of the frontier region is one of underdevelopment due to repeated negligence and oppression. For a large part of the British rule in India, the frontier tribes were only seen as “the Gatekeepers of the Indian Empire.” As D.P.Singhal fittingly describes in his book India and Afghanistan: a Study of Diplomatic Relations 1876-1907, Britain’s imperial defense policy towards Russia was what dictated how the frontier region was dealt with. The British Army had a constant presence there and on more than two occasions it trampled over the region on its way to Afghanistan. In the face of such military presence, the locals saw their liberties get reduced over time with laws such as the Frontier Crimes Regulation, which advocated collective punishment. Instead of trying to reform, the British took the easier route of cracking down on the frontier. In fact, even Montagu-Chlemsford scheme of 1919-20, which outlined a relatively democratic structure of elections and local governance for provinces of India, did not arrive to the frontier region until ten years later. From an early age, Ghaffar Khan was pained by the backwardness of his people and the unfavorable treatment by the British. In fact, his main grievance with the British throughout his life was their hesitation in introducing reform in his province. So, at age 20, he began the work himself. In 1910, he built the first school in his village, Utmanzai. He considered the building of schools the most urgent need because “I was well aware that the illiteracy and ignorance of my people could only lead them to ruin and destruction,” he wrote. The building of schools and the campaign for literacy was a first step in Khan preparing his people to rid their coercive traditions and embrace nonviolence as a way of life. Mukulika Banerjee, an anthropologist who studied Khan and his movement by interviewing veterans, writes that Khan had put nearly twenty years of work “to raise the consciousness and understanding of his audience before calling on them to make sacrifices.” This had laid the ground for the later success of his movement. The two decades of preparatory work consisted of building over seventy schools in the Frontier, establishing their own newspaper, touring villages to preach literacy, and organizing political rallies and processions to unify the frontier and place it again in the larger context of the region. In 1929, Khan founded the Khudai Khidmatgar, which literally translates to Servants of God. The Khudai Khidmatgar movement became the means for the reform necessary to rid the Frontier from the violence that it was notorious for and march towards calm and prosperity. At the heart of the Khudai Khidmatgar movement was service and nonviolence. In the pledge that every member had to take, the notion of service is wonderfully justified. “I am a Khudai Khidmatgar, and as God needs no service, but serving his creations is serving Him, I promise to serve humanity in the name of God. I promise to refrain from violence and from taking revenge. I promise to forgive those who oppose me or treat me with cruelty. I promise to refrain from taking part in feuds and quarrels and from creating enmity.” There is a clear acknowledgement of the religiosity of the community in this pledge, yet the emphasis is on the universal human, working against certain extremist ideologies of his time. In fact, Ghaffar Khan’s struggle was as much against the dogmatic Mullahs as it was against the superstitious and cruel traditions that eroded the Pathans. According to Banerjee, the movement grew from 1,000 to 25,000 within a year. At its peak, the movement was 100,000 strong. Despite the success achieved, Khan is quick to recognize its fragile state. Therefore, he is so firm on the principal and will not stray– even for the grand promise of independence. Post independence, however, as Pakistan was split from India and the Frontier region fell under its jurisdiction, all the good work that Ghaffar Khan had done to reform the frontier was reversed. For his closeness to Gandhi and the Indian national congress, and his opposition to creation of Pakistan, he and his people were seen as traitors by the Pakistani government. The state assumed a policy of negligence and repression towards the frontier regions just like the British had, though for different motives. Later, the region was used as the nurturing ground for religious militants trained and indoctrinated to fight the Soviets in Afghanistan. The frontier, despite the struggles of people like Ghaffar Khan, remained underdeveloped, without a strong infrastructure, and vulnerable to attack of the beast that we know as extremism today.